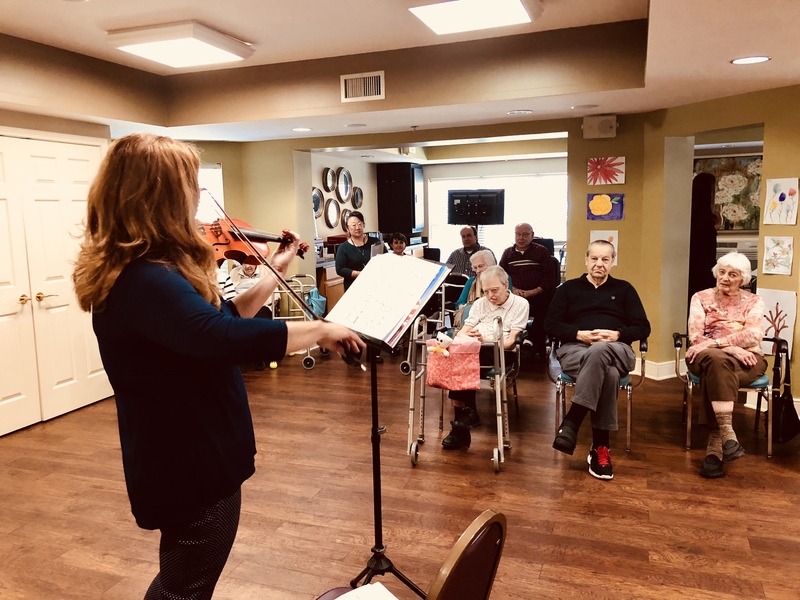 One of my favorite ways to give back is by playing my violin for members of my community. In my life, I don’t have many chances to slow down, calm down and relax. When I play my violin, it automatically happens: my heart-rate slows, my mind focuses on only the present moment, and everything else just fades away. Music is also one of the most powerful and magical ways I have found to connect with others, so I am so grateful for having the gift of music in my life. I love to share it with as many people in as many ways as possible. Last weekend, I was fortunate to spend time with the residents at Westbridge, the assisted living facility at Wyndemere in Wheaton. We brought eight kids with us as well, because I feel it is so important for them to see what it means to give to others. I spent the afternoon playing a variety of music from classical pieces, to standards from the 40’s, and American folk songs everyone knows by heart for the residents. My favorite part was when they hummed or sang along– like when I played Embraceable You. Enjoy! Paid for by Lynn LaPlante for Dupage County Chair. See www.elections.il.gov for a copy of our report filed with the Illinois State Board of Elections.